Josh Cook (BTC Racing, Honda Civic Type R), Andrew Jordan (Pirtek Racing, BMW 330i M Sport) and Rory Butcher (AmD, Honda Civic Type R) are the winners of three races at Brands Hatch Indy Circuit in the opening round of the 2019 British Touring Car Championship. Josh Cook recorded his third BTCC victory in a career. Andrew Jordan climbed to the top podium spot for the 21st time while Rory Butcher clinched his maiden BTCC win. In the first race, Josh Cook has won after he started tenth on the grid in the #66 Honda Civic Type R, thanks to clever tyre strategy when he chose slicks for the drying track whilst the first nine starters had wet tyres. Ashley Sutton started from pole in the #116 Subaru Levorg GT, making a getaway ahead of Jason Plato’s Vauxhall Astra three BMWs of Colin Turkington, Andrew Jordan and Tom Oliphant. Plato lost P2 to three BMWs but the thing got worse when he received a drive-through penalty for a start line infringement. It took few laps for Cook and other dry-tyre runners to gain an advantage of drying track. He was flying through the field after that, quickly coming to the tail of Ash Sutton and then taking the lead. Jake Hill was following him in the TradePriceCars #24 Audi S3 Saloon, taking the second place and his only second BTCC podium in a career. Tom Chilton crossed the finish line third in the #3 Ford Focus RS. Two Mercedes drivers Aiden Moffat and Adam Morgan completed the top 5. In the end, the best among the wet-tyre runners was Matt Neal (Halfords Yuasa Honda) in the eighth place. Pole-sitter Ash Sutton finished just behind him. Two BTCC debutants Michael Crees and Mark Blundell both scored championship on their respective BTCC debuts, finishing 12th (Crees) and 14th (Blundell) among thirty starters. In the second race, Andrew Jordan gave the first victory to all-new BMW 330i M Sport after making fantastic progress from 15th place on the starting grid. The weather conditions were changeable between two races but, unlike in the first race, all 30 drivers chose to start the race on the Dunlop SportMaxx dry tyres. After 24 laps, Jordan crossed the finish line 9.728 seconds ahead of Ashley Sutton. Adam Morgan finished third in a Mercedes, in a photo-finish against Jake Hill, Tom Ingram and Stephen Jelley. Josh Cook, who won the first race and started from pole in the second race, managed to finish in the seventh place in his ballast-laden Honda. In the third race of the weekend, Tom Chilton’s #3 Ford Focus RS crossed the finish line in front of Rory Butcher’s #6 Honda Civic Type R. After the race, Chilton received a five-second penalty. His gap to Butcher was 1.995 seconds so they switched positions, giving Rory Butcher his maiden BTCC victory in a career. Stephen Jelley reached the third spot on a podium after a great drive in the #12 BMW 125i M Sport of Team Parker Racing. Jelley returned to the podium for the first time since 2009 and his great season when he was a race winner two times. Josh Cook finished fourth in the third race, taking the overall lead in the Drivers’ standings. He leads the championship standings with 44 points, ahead of Tom Chilton and Stephen Jelley. 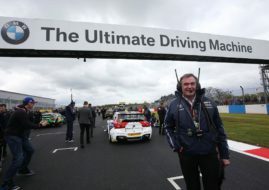 The next BTCC round is scheduled for April 27-28 at Donington Park.